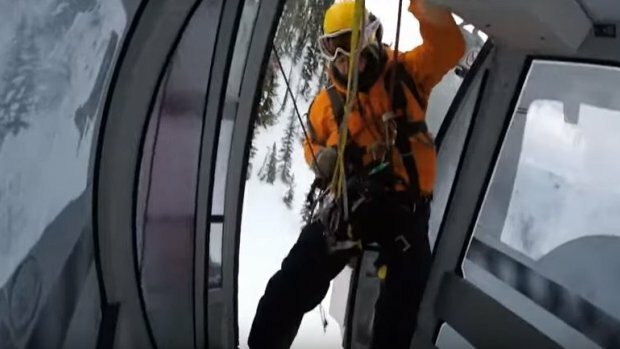 Two skiers got a thrill they were not expecting recently when a helicopter airlifted them from a broken gondola at Kicking Horse Mountain Resort in British Columbia. A video of the rescue that sent the pair soaring over treetops, dangling from the chopper above, was captured on video and posted to Youtube recently. Kody Laponte, 16, who shot the video with his father Manny told CBC News the pair were “insanely excited” after realizing they would be rescued by helicopter. “They dropped the rescue down on top of our gondola and he put us in parachute-type things, hooked us to the rope and off we went out the door up in the air,” he told the news outlet by email. Kody and his father were among 75 skiers who were rescued from the Golden Eagle Express gondola at the BC ski resort Jan 3. Only those near the highest section of the lift were plucked away by helicopter giving the pair quite a thrill in the process. An electrical transformer was said to be the problem. A spokesman for the park said that because of the way the transformer blew they were unable to utilize its emergency restart functions. That’s when they initiated evacuation procedures.